House Speaker Paul Ryan, a Republican from Wisconsin, was asked by reporters on June 6 for his reaction to a tweet by President Donald Trump that he could pardon himself and others to erase any convictions related to the special counsel’s probe of his campaign’s ties to Russia. “He shouldn’t, and no one is above the law,” Ryan responded. Two days earlier, Trump had tweeted, "As has been stated by numerous legal scholars, I have the absolute right to PARDON myself, but why would I do that when I have done nothing wrong?” It also followed the suggestion by Trump attorney Rudy Giuliani that a sitting U.S. president could not be indicted. The Supreme Court has never addressed whether a president can pardon himself. It has, however, issued a handful of landmark decisions that focus on the limits of the power of the presidency and assert its own authority to have the last word on what powers fall under the purview of the judiciary. One of the first significant decisions that established limits on presidential authority came after President Harry Truman in 1952, on the eve of a strike, ordered the seizure of most of the country’s steel mills for the ostensible purpose of maintaining production during the Korean war. The owners sued, and later that year the Supreme Court ruled 6-3 in Youngstown Sheet & Tube Co. v. Sawyer that Truman had overstepped his authority because he attempted to make law through executive order. 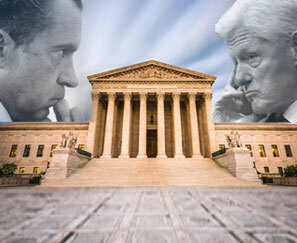 The Supreme Court cited the Youngstown decision as precedence in the Nixon “tapes” cases. The 8-0 decision underscored “the fundamental demands of due process of law in the fair administration of justice” and directed President Richard Nixon to obey the subpoena of Watergate special prosecutor Leon Jaworski. Nixon was ordered to produce tapes and documents and he resigned shortly thereafter. The Youngstown decision was also referenced in the Supreme Court’s refusal to delay civil proceedings against sitting President Bill Clinton when Paula Jones claimed that she was punished by her supervisors in her state job when she rejected sexual advances Clinton made as governor of Arkansas. In a unanimous decision by Justice John Paul Stevens, the court ruled the suit could move forward against a sitting president. But the decision specifically noted it was not addressing whether the court could “compel the president's attendance at any specific time or place” to testify. In the wake of the 1997 decision, Clinton agreed to provide a deposition in the case — the first time a sitting president has given testimony in a civil case in which he was a defendant. Still, there could be times when the president might act in a way that is above the law. The Supreme Court’s 1974 Nixon decision, for instance, noted “limited executive privilege in areas of military or diplomatic affairs.” But more than 40 years later, the extent of what the Burger court meant by “limited executive privilege” remains largely undefined.